One of the criticisms over the years is that EVGA has not been on par with the major motherboard manufacturers when it comes to their BIOS/UEFI interface and feature set. Truth be told, the other vendors have dozens of engineers working on them, whereas EVGA only has a handful. 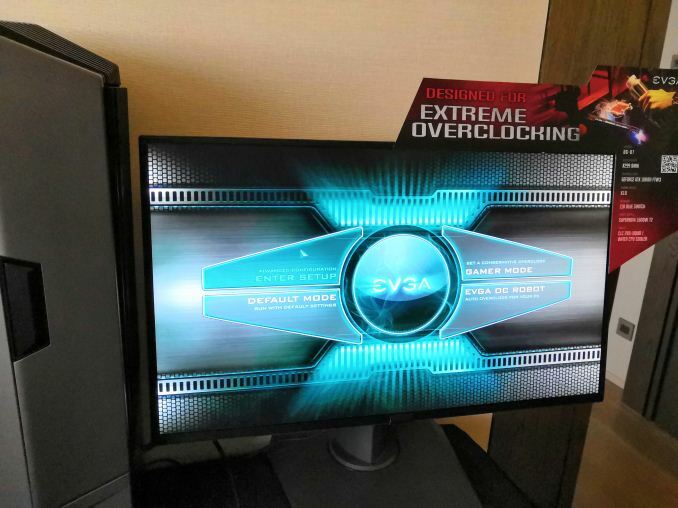 Despite this, EVGA has slowly crept up to match the other vendors by slowly adding the latest options. 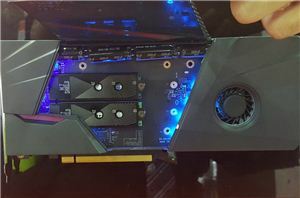 For the first time it seems, EVGA now has the march with a new feature not seen on other products. 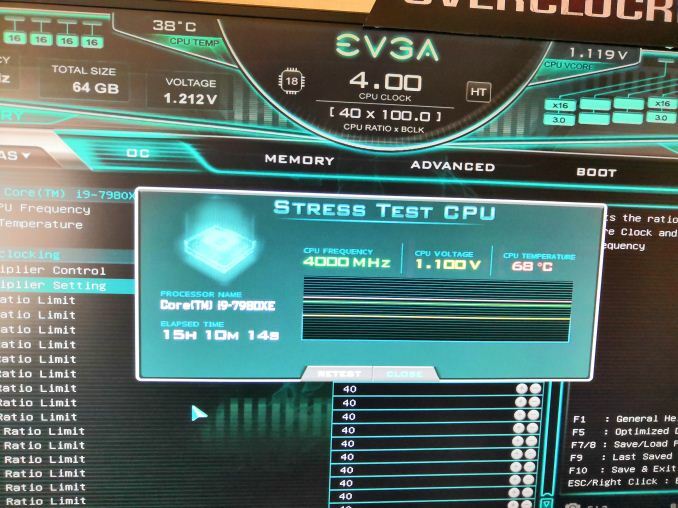 We have seen stress testing before to find the best overclock, but we’ve never seen a direct stress test before. The key to what EVGA provides is that users can manually invoke a stress test based on their current configurations while in the BIOS. 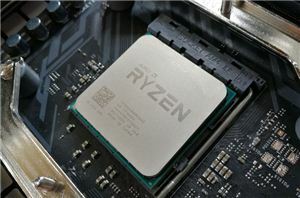 The stress test will implement a Prime95-like CPU stress, and the BIOS will fire up a display that shows the frequency, voltage, and temperature of the CPU. 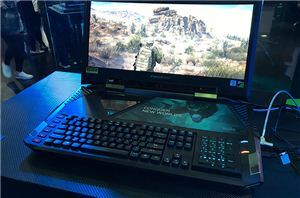 Normally in the past, we would expect the interface to be slow (because it’s in the BIOS), but EVGA updates the display at a proper refresh rate, showing the live results of the sensors on board. 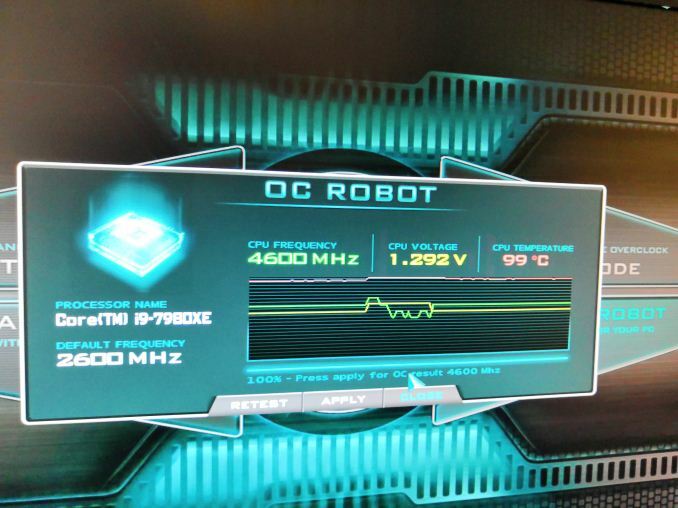 The new BIOS is also higher resolution, and has an EZ-mode so users can go into an OC Robot mode (to find a good overclock) or into a Gamer mode focused on what matters for gamers. 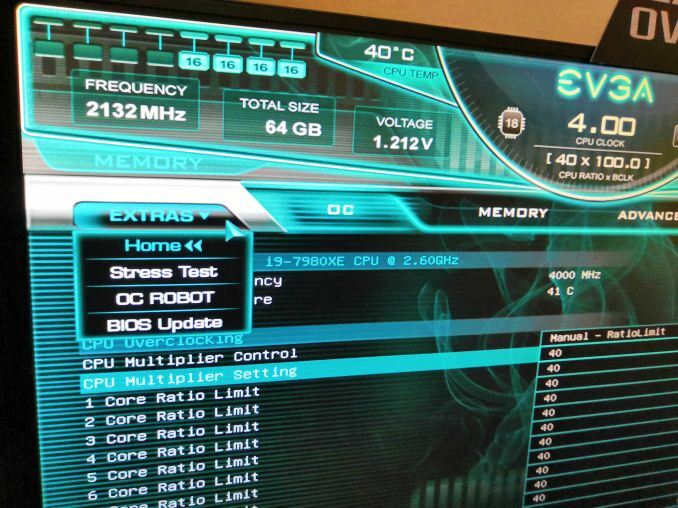 EVGA expects to roll out the new interface very soon, starting with its X299 motherboards first. it should be, but often is not for whatever reason. I am 100% with you however, we damn well should be able to test NOT using a desktop operating system environment just to "test" the overclock/settings, BIOS/UEFI is generally far far more stable than it was 5 or 10 years ago, but at the same time for as long as they have been making these things (20+ years?) they really should be bullet proof and no use the consumers as guinea pigs to find problems they can and should find (within reason) before they put it on the shelf. such as Ryzen 2xxx not working "out of the box" and needing a boot kit shipped from AMD. yes Win 10 includes "more" of the drivers etc auto installing, but we generally have ZERO control of what it does or does not install, which is never a good thing (could mean killing that brand new part that needs a very specific driver to function properly etc).